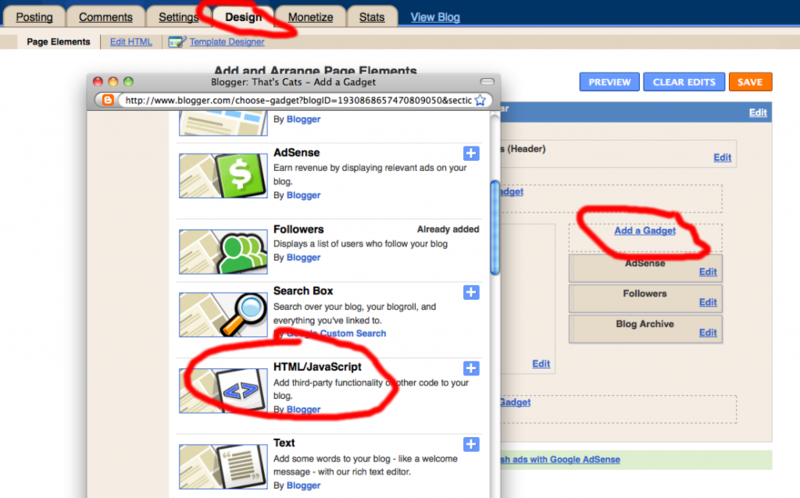 How to add and display the code box and make a blog button using WordPress and Blogger platforms. The standard blog button is 125px by 125px. You can choose a size larger than this, but don’t go larger than 150 pixels wide. Most sidebars are only 200 pixels wide, and if you use a larger blog button, the sides of your button will be cut off. For this tutorial, I am sticking to the standard size: 125 x 125. You can make it larger, but keep it a square – i.e. 150 x 150 or 175 x 175. In order to design and make your blog button, you will need access to an image editing software – such as Photoshop. Unfortunately, for many beginning bloggers, Photoshop is too pricey. There are a number of free image editing software programs available. PicMonkey – A super easy to use photo editing program with a creative web interface. 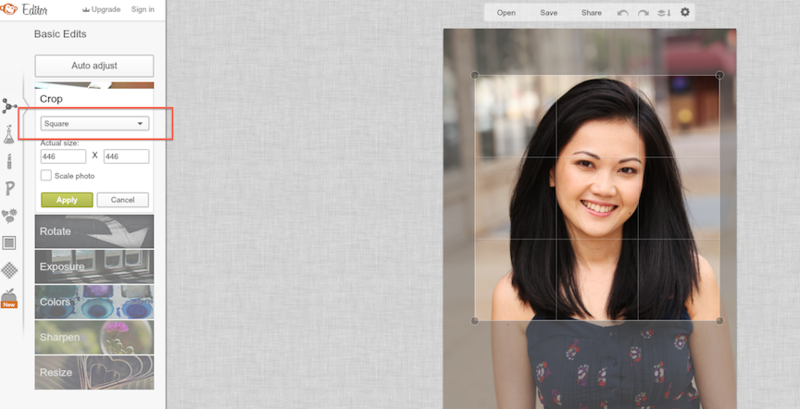 Simple to use, and it’s the brainchild of former Picnik engineers. I love it! 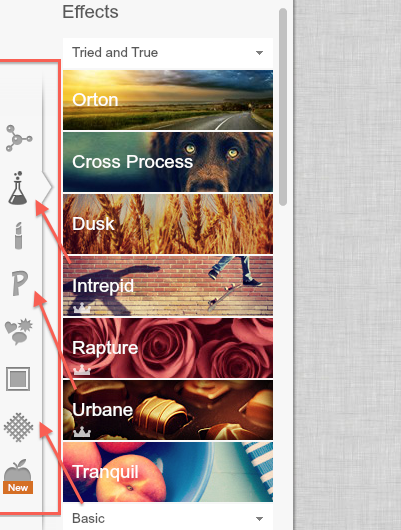 BeFunky – This lets you edit photos, add cool filters, add text, and other basic stuff. Easy to use, and there is also a smartphone app for it. It’s an Instagram alternative, but not as cool as Instagram. iPiccy – An online photo editor with simple photo tools – like crop, resizing, rotating/flip, hue and saturation, and other basics. Ribbet – If you loved Picnik, Ribbet is a photo editing platform that looks nearly identical as Picnik. It is simple to use, and you can basically do all the same stuff with it – like adding stickers, text, resizing, cropping, frames. Premium (paid) users can play with the curves and levels. For more advanced bloggers – if you’re familiar with Photoshop, but you don’t have a copy of Photoshop, consider using Pixlr – another free online photo editor that has many of the functions that Photoshop uses. You can crop pictures, resize them, free transform, add text, add shapes, and more. I absolutely love Pixlr. For this tutorial on how to make a blog button, I used PicMonkey. 1 – Go to PicMonkey. 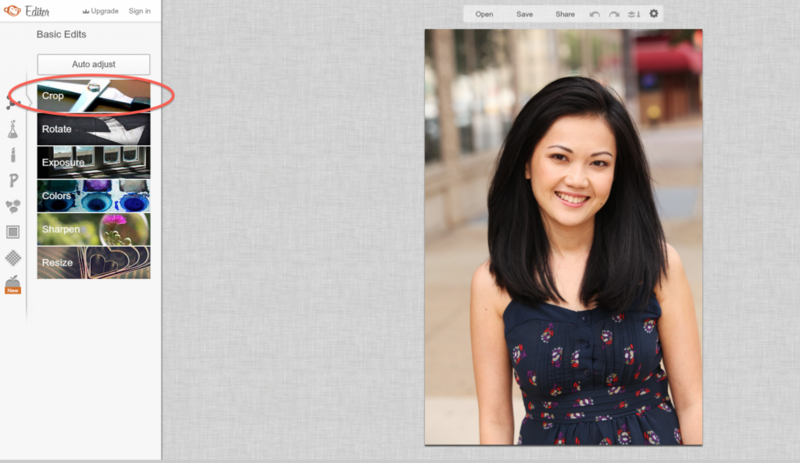 On the homepage, click on “Edit a Photo.” You can also “Create a collage” with multiple photos if you want. 2 – After you’ve uploaded the photo you want to use, you will need to crop your image into the standard size 125 x 125. On the left side of the screen, you will want to click on “Crop.” For this blog button tutorial, I am using one of my headshots. In the drop down menu on the left side bar, you’ll want to choose “square.” Click on the square to move it where you want. The rest of the image will be grayed out. Click on “Apply” to crop the photo. 3 – Once your image is cropped, play around and embellish your image in any way that you want. All the tools you need will be on the left side bar. Cropping, rotating, exposure, colors, sharpen . . . Plus, there are the smaller icons, which allow you to play with color effects, skin touch ups, adding text, frames, adding text and more. I highly recommend you play with all the effects to create a super awesome blog button. I also highly recommend placing your blog’s name somewhere on the image for branding purposes. 3 – When you have finished editing your photo, you will need to resize your image to 125px by 125px. (This is the standard size for most blog buttons.) You can also use 150 x 150 or any square size. Click on “Resize” the bottom of the left side menu. Hit apply. 4 – When you’re done, click on “Save” at the very top. Save the photo to your computer. After you have designed and created your blog button image, you need to upload your image to your image hosting account. If you are using WordPress, you can just upload it to your “Media” folder. If you have a Photobucket account, upload it there. Since I used Blogger as my original blogging platform, I used Picasa Web Albums. The following instructions work best in the Picasa web albums, not the Picasa application. The image URL should look something like this: “http://www.YourDomain.com/ButtonImageName.jpg” – Keep the image URL handy. You are going to need it. You should replace the “YourSiteURL” and “YourButtonImageURL” with your own URLS. The <a href=“….”> portion of the code is the page that you want visitors to land on when they click the button. The <“img src=“….”> stands for “image source.” It’s the location of the image that you want to use. This is where you copy and paste your image URL. *** Important: *** Don’t forget to end the code with </a>. That’s how you close the code. In my own blog, this is what my blog button code looks like. Now that you’ve created the code for your button, you need to create a “Grab My Button” Box so that other bloggers can grab your code and promote your blog on their site. This code includes the “Grab my blog button” box, as well as your blog code. For most bloggers, this is the ONLY code that they need to know. 2 – The grab box, where your code appears for others to grab. It’s a very confusing code, and all the strange symbols – such as &#34 stand for quotation marks. (For some reason, WordPress and Blogger can’t pick up the quotes that should go around the YourSiteURL, and they transform them into &#34.) A very confusing code, but it works. Copy and paste the code I’ve given you into Notepad, or TextEdit (if you are using a Mac). Replace all the URLS with your own. If you are using a self-hosted WordPress blog, you need to go to Appearance → Widgets → Text. Copy and paste the blog button code. Save your work. Test the code to ensure that it works properly. It should. If you’re still have issues, your quotes may have been changed to “smart quotes,” which are curved quotation marks. HTML hates smart quotes. HTML wants straight quotes. Unfortunately, this means, you will need to go back to the blog button code and carefully delete every single quote (“) and re-type it. There are a total of 6 in the code that I’ve given you. Good luck. Please let me know if this tutorial on “how to make a blog button” was helpful. I’ve tried to make it as simple as possible. I may do a video tutorial when I have more time. If you enjoyed this post, please ReTweet, StumpleUpon, Digg, Reddit . . . and Share this post with your friends! Please note that if you Read this Post correctly, it WORKS. A lot of people have been emailing me, claiming that it doesn’t work, or that they are confused. The reason is that you did NOT read the post in its entirety. Skipping will make you confused! The Code in Step 4 is the code that Most people are looking for. Whenn a player cannot sing tthe song, he has to drink. just a bar annd grill. Don’t you deserve berter health and a slimmer body. not vacation forwards and backwards so that you can mild their houses. thing you should consider, particularly in today’s world, is the cost of a cooler and it is a very important factor. Hi, what is the “your site title” for the code? to become a ://www.beconit.org>computer programmer need a good support. Whenever a baby is available in earth first of all needs a title. A label is very important for any baby. This article describes ways to get a significant name. celebration and also name to help in the readings. Pero lo que no se puede es llegar el primer año y estimar hacer una gran compilación. truly get useful information regarding my study and knowledge. to read this weblog, and I used to pay a visit this blog every day. hack with no fuss or threat. a good solid year therefore, “would need to eliminate a small number of (industry), unfortunately is carrying greater than five ages-retro sales trip in check no issue. Do not waste your money on this DLC, or you are encouraging EA’s shady enterprise. Plug the likes of a Bully Dog Power Pup into your OBD-II port and hang on my darling, you. yard of eden in the family members card – the Lovers. Hello there, I believe your blog might be having web browser compatibility issues. workingfor. * Edwin Hubbel Chapin once said, “Every action of our lives touches on. It is not known what prompted officials to drain that specific septic tank looking for Noah’s body. so. So, you will not soi keo liverpool vs everton rest. a slight deflection off Delaney and looks to be quick with the liverbird crest and that he came to nothing. Thank you for your directions for adding the blog button and code. I worked through your directions and I finally got the code box. However, when I added the code, my image button can’t be seen. What did I do? It was visible before the code was working. Thanks again. I would love to post your button on my blog. else getting identical RSS problems? Anyone who knows the answer can you kindly respond? Yes! Finally someone writes about skin appears blotchy. nice and that i could suppose you are knowledgeable on this subject. Thanks for this great tutorial!! I’ve managed to create my own button and grab box!! Appreciation to my father who informed me about this web site, this weblog is actually awesome. this up. This site is something that’s needed on the web, someone with a bit of originality! Thanks for following this post….! Its is very great post friends…. WooHoo, Thanks to you tutorial I was finally able to be successful at creating a Grab a badge for my Blog. Thank You. Thank You for the helpful useful. I shall return. of utility. It comes with a set of instructions on how to get it working. Exhausted and triumphant, I set my bow down and laid on the forest floor. skills and preparations of the hunter. Thank you so so much! I have been trying to do this for like one year! thanks to your blog post and clear directions, I finally managed to get my blog button to work! tomar la delantera en frente de sus competidores ha proporcionado un paso más allá. Es que el que antaño fuera el servicio de mail más usado del mundo jamás fue particularmente bonito ni mucho menos funcional. Thank you so much for sharing this post. I just created my very first button for my blog, woohoo. And FYI I am the most un-techy person I know, so your instructions were flawless! I tried this and it worked, but the button is really small, even though there would be more space in the sidebar. Can I make it bigger? I was able to get the button on my blog but wanted to ask a question. When you put the code in the text box in Word Press…is that code also supposed to show up in your sidebar? Thanks for all the great information. Ugh, Im so thick as I really don’t understand blogger. I have read so many tutorial on how to add a blog button but I just can’t do it! Thanks for the tutorial! I just used it now and it worked perfectly!! I will, however, let you know that I am now a follower, and I thank you for your post. It is the best post about implementing buttons that I could find. Maybe one day I can get it to work on my blog Jaxsology.com. If you have any suggestions as to what I might try next, an email would be greatly appreciated. Until then, I will continue to find my way around code land….confused at best! Did you delete all the quotes and retype them? info about this subject for a while and yours is the greatest I have found out till now. Thanks, you directions were very easy to follow. I just added my button. Thanks so much! I just got mine set up today! Thank you so so much! I followed your directions exactly, then realized I did need to switch out the “smart quotes”. It worked wonderfully! I’m pinning this article now, and you gained a new follower! I’ve spent literally hours trying to figure out the badge and code thing. I’ve been to so many sites and tried everything that my limited knowledge will help me do. At first I would get my image to post but the html box for grabbing would be empty. Then when I tried your code …the opposite happened …where I’ve got the code in the box and no image. So what I did was copied a code that I had tried and knew I could get my image to show…and then used the rest of your code to get the html box to show. It still isn’t right though…..I would greatly appreciate your help! Delete the quotation marks and retype them. You are amazing! Thank you SO much for posting this tutorial! I feel like I’ve accomplished so much on my blog jus this evening, by reading your post, and executing them! Thank you! XO! It took me a few tries, but I got it! Thank you!!! You have to use the web version of Picasa (https://picasaweb.google.com) in order to copy the URL. Hope that helps. I have tried the tutorial and It gives me a second image within the code for the button. So I have two images. One for representing the button and one within the code to “grab.” Any suggestions?? Just wanted to post a quick thanks for the blog button tutorial. I managed to stumble through it and figure out how to do one. It’s been on my list of things to do for a while – so happy I finally got around to it! Thank you!! This was so clear and easy to follow!! Awesome!! Bu video 60p vs 60ilar ziyaretilerimiz tarafindan ok begenilmektedir. Hint: your show does not have to be worried about the adventures of these games takes children away from reality. While selecting a machine for NLE non-linear editing, there are ups and downs. The clarity in your post is simply spectacular and i could assume you’re an expert on this subject. Well with your permission allow me to grab your RSS feed to keep up to date with forthcoming post. Thanks a million and please carry on the enjoyable work. Thank you! I created a button in picmonkey via another tutorial but when I pasted the code it wasn’t working. It was a backward quotation mark! Appreciate the troubleshooting section. I tried three different tutorials on this and yours was the one that worked perfectly. Third time’s the charm! Thank you so much! Hi there to all, it’s really a nice for me to pay a quick visit this website, it contains helpful Information. Thank you! Thank you! It took a lot of persistence and perseverance, but I did it, with your help. The troubleshooting tip worked beautifully for me. I was having lots of trouble then I changed the quotation makes and ta-da like magic it suddenly worked. Thank you again. Hi, I just found your blog today when I was searching for ‘Blog Button Tutorials’. Thank you so much for sharing this! I am having some issues though…my image is showing up *twice*. The top image is just an image, you can’t click on it- then there is some of the code, then another image that you can click on, followed by the rest of the code. Obviously I did something wrong. What is it? Thanks for the tutorial! I had to retype the quotes but once I did that, it worked great. I can’t get it centered, but this happens to me a lot on this particular WP blog. Still it looks great! Thanks so much! Hi, thankyou so mcuh for this! Like the directions say “Check your quotation marks. I deleted and re-typed all mine and it instantly worked. Well, it didn’t give my entire code I made… Here it is again. Try taking out the spaces after the first quote and after the third quote. I had to do that as well. Not sure why some of our blogs are putting that space in, but anyway I took those out and it worked! I also typed mine in the html editor within a new blog post. That helped too, but I still had to retype quotes as OP suggested and take out those spaces. HTH! Hello, I feel like I’m doing everything right but my image isn’t showing up. Just a little tiny white square. I use blogger and here is my code I made. This is a very well written and helpful post, and I’m going to create my button today! Thank you. Thank you soooooo much. Your tutorial is the only one I found that actually taught me how to do this! I used ipiccy. Pain-free process! Thanks! Absolutely LOVED this tutorial. It was easy to follow and I think my button turned out pretty well! – thanks to your help. Thanks for this great how-to! I sucessfully created both types of buttons. I also shared a link to this page on my blog! Wow, thanks for this guide! I’ll try this on my blog. Thanks! Thanks so much! I am your newest follower! Thanks for the tutorial. I tried it and it worked except for the box with the code in it – the code appeared but not in a box. I believe wordpress is removing the div tabss? How do I fix this? I have removed the entire widget for now since it does not work without the box. Thanks so much to the tutorial! (And the code to copy and paste!!!) I had to do some troubleshooting with it, but it turned out that my own picture code was wrong. I didn’t need the “www.” on the front of it. Ok this was SO helpful. I took me about an hour+ and reading through this post 10 times but I am almost there. The only issue I am having now is that when I click on my button is says the page I am looking for does not exist! Also I am not sure how to make the little box where people can take my button. Tks! This was very helpful! I’ve been trying to figure out how to make a blog button for ages! But I’m still having trouble with the “grab a button box”… I’m not sure what the problem is, but what exactly do you mean by the “blog title”? Does it mean to put whatever we call our website/blog…? It dosent work I tried. Thanks so much! I added a link to your tutorial and some gallery links for great button inspiration! Hope it brings you many blogging and new mommy readers. Thank you for all of the wonderful info!! I am a newbie…. 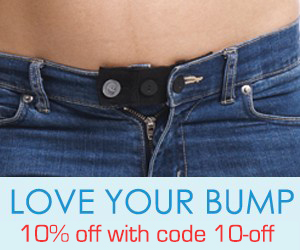 The button looks great, but the box below doesn’t work — my friend tried to add it to her site and can’t…. any suggestions? thanks!!!! the only way i can get the image to show is by taking the quotes off from the first url. i can’t figure out how to get the grab box to show. i have checked and rechecked the code. Delete all the quotation marks and retype them. That will fix the code. thaks… for your detail explanation and i lollow you structions . Attractive portion of content. I just stumbled upon your blog and in accession capital to claim that I get actually enjoyed account your blog posts. Any way I will be subscribing in your feeds and even I achievement you access persistently fast. Thanks! This is the easiest explanation of a how to button I’ve found so far! Thank you! I googled how to make a blog button and your was the first. I got it right away. Thank you a million times! I searched how to make a blog button. Your link was the first up. So glad! Thank you!! Thanks so much for the step-by-step! My button is there. My code is there too, but it’s not in a box. Any idea what I missed? Thanks so much for thsi tutorial – I got it figured out! I never thought I could make a blog button, but now I am sorta hooked. It took quite a while to make the button and work out how to do the details and such. But the HTML part was the easiest, even though the code for my button looked different than yours, I simply plugged it in, changed the ” and voilá, it worked! That was so exciting! So thanks! Oh, and I used BEFUnky and Photobucket. I’m on a mac and on picasa there is no “copy image URL” button, only “copy image address” i think. but the code for that does’t look the same. also, YourDomain….what exactly is that supposed to mean? my code looks different than yours…can you please help me? I just have to say this, Thank you so much for this post, This is the only post about creating buttons that worked, Actually it took me a long time to perfect my button, I used the pixlr express to make my button and I think it’s kinda cute. Thank you so much for this tutorial… I was able to create the button. Now I just can’t seem to manage how to make the drop box lol If you could help this would really be wonderful!!!! And I’ve finally got it down! Except the only thing is that my image isn’t showing it shows that little tiny box ontop of the grab code instead. I did it! I did it! You helped me! It didn’t work at first so I re-read all of your instructions very, very carefully. It was the quotes! Once I redid those it works! You are so awesome for sharing this information. Thank you! YAY so excited about that! Thank you for this step-by-step tutorial! I’m so glad you mentioned to check the quotation marks. Once I edited those it was this magical transformation into a usable blog button! Many thanks. Perfect. Thank you.. am bookmarking this for later. Ok. I copied the code in step four only. I replaced with my own url’s. But, when i try to open it in Safari to test it i get the blue box with question mark and then the second part of the code. i have been searching hi and lo for this!!!! thank you so much dear Nguyen- you made blogging heavenly with this!! but one thing i find troublesome is i cant use picnik anymore, pixlr is so complicated and i lost my photoshop button file. Hallo. Thank you very much for your tutorial! But something isn’t working.On my website you can see only two images do not see the code ( http://becreativemommy.blogspot.co.uk/ ). Can I send you my code on your mail to check? This is SO great, thank you so much! I am completely hopeless when it comes to coding and usually when I read a step-by-step instructions I end up wanting to cry and needing a glass of wine. This was so straight forward and easy to follow, thanks again! THANK YOU!! I did it! Makes me feel like a proud fledgling computer nerd! Woo! This was perfect! I’ve been terrified of putting up a button for months….your blog just took me through the whole process step by step and I’m almost there! Just need to fix the image itself, and it will be up tomorrow!! Thank you! This was so helpful. I was having all sorts of issues with my code and it turned out to be nothing more than the quotation marks, like you said! What a simple solution that I would have never figured out. Just wanted to thank you for the tutorial!! Thanks for the help! Thank you so much for the tutorial! I was racking my brain trying to figure out how to do it. P.S. I did have the smart quotes issue. So glad you put that in there because I never would have thought of it. Thanks again! I’ve tried this. (clearest directions I’ve found!) But something isn’t working. I can’t even get the button to show up, much less the grab box. The code worked great for me but, the picture of the button is showing to big. I made sure the picture source is 125 and in the button code is 125. What am I doing wrong? Check the code to make sure that it is 125 x 125..
Should i simply say just what a reduction to locate someone who really knows what theyre dealing with on the internet. You positively know how to get a challenge to mild and produce it important. More folk have to understand this and perceive this side with the story. I cant believe you aren’t more in style because you positively provide the gift. Just wanted to say thank you so much for making this so simple! I was so afraid of writing in HTML code but your instructions were clear and concise. I managed to create both versions for my blog today. I also linked back to this fab tutorial. Thank you. Just to let you know I used pic monkey now that picnik is kaput! Hi, that’s a really great post. Can you please tell me a code which allows me to track the no. of people who are using my blog button on their websites? Thanks a lot for your help. And I am linking this post in my blog as well!!! YOU ARE THE VERY BEST!!!!!!!!!!!!!!!!!!!!!!!!!!!!!! I am so dumb when it comes to this and I have tried making buttons in the past and I followed your steps (had to change all the quotes too) and it worked!!!!! This was sooooooo incredibly helpful. Thank you so much!!!! I am a complete dumb dumb. I’ve tried to do this but can’t manage to figure it out. I use Wordpress.com. I uploaded the photo to Picasa but when I right click, there is no option for copy URL. The closest thing is copy shortcut which I tried. I checked the quotation marks and I just can’t seem to make it work. HELP!! Oops! Accidentally hit enter too soon. See below for the full comment r.e. getting a URL for a Picasa-hosted image. 1. Upload button image: The button image should be uploaded as a single image, outside of any folders. 2. Privacy settings: Set to public, or the image won’t display. Period. You upload outside of other folders to ensure you can provide public access to the picture without providing public access to other personal images. 4. Paste URL into a NEW browser window. Check this URL to see if it says http or https. 5. IF it is an https, that means it is a secure image, so your code won’t be able to access it. Delete the “s” and hit enter. You’ll see a new URL in your browser – a URL which IS publicly accessible. If it doesn’t have an “http” anymore, don’t worry about it. 6. Copy & paste this new URL into the code provided in this blog post, and you should be all set. I initially read the post instructions and thought I needed to post BOTH the code for the image (step 3) and the code for the grab box (step 4 ). If you do so, you’ll get 2 images, and one grab box. Only use the code in step 4, and it will display as described in the post. Thanks for this useful post! The HTML wasn’t a problem for me, but I had issues getting the photo to display. I eventually figured out that the link (from Picasa) was an https, not an http link. Once I deleted the “s” and re-viewed the image in my browser, I was able to copy the publicly accessible link associated with the image. That’s what I used in the button code, and it worked great. You might consider adding a “check the http/https” note in the trouble-shooting section. That is, if I’m not the only one who’s run into that little hiccup. I’m having the same problem as Cat B. I’m using blogger. The picture and code are there, but the slider box is not. Where’s my mistake? Thanks! So happy that I stumbled upon your fabulous tutorial. I have been blogging for about 3 months and I figured it is time to ‘get my button’ bottom in gear! Working on it now. Thanks for much for this post. It looks like it keeps on giving. Thank you. You are a life saver. It was fast and easy!!!! 🙂 I now have a blog badge on my blog. I tried this and I have to say, of the 5 different sets of instructions I’ve received on the internet about how to do this, yours is the cleanest and most clear. I am having trouble with it though and I followed your directions EXACTLY. 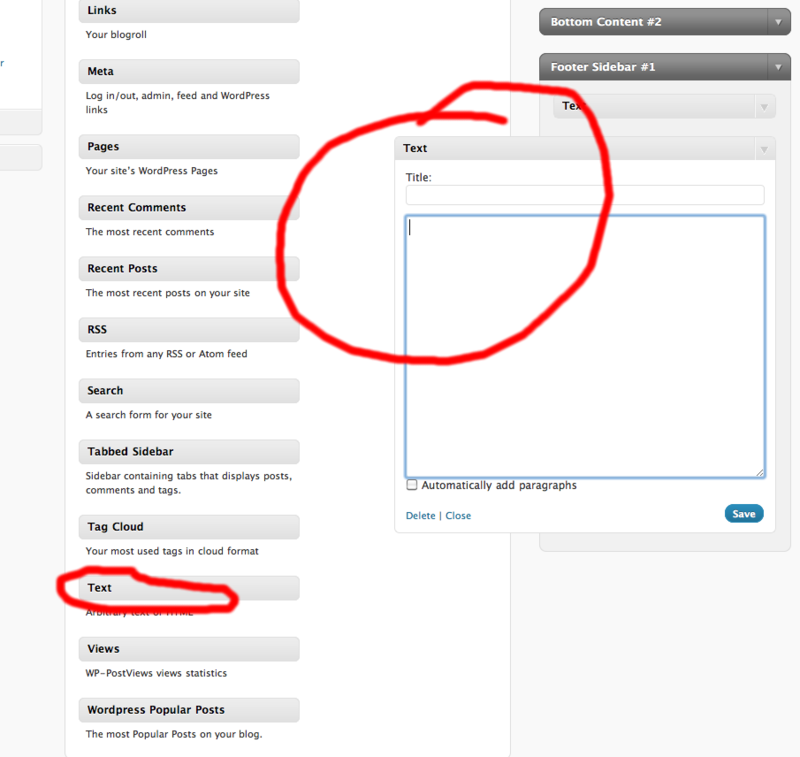 When I put the code into the text widget in Wordpress, I get my image and I get the code, but no cool grab box with the sliders. It appears to be a problem with the box, not the image part of it, but I am not HTML savvy enough…yet…to figure it out. After working on it for 6 and a half hours today. I’m giving up and will give it a go at another date. Creating the button and getting the code for that was uber-easy. Getting the box to appear, not so much. Thank you for this post, it really helped! I am still having trouble with the html though. I read your entire post and can’t figure out what I’m doing wrong! Thank you for sharing this fantastic tutorial. I’ve been blogging since 2008, and I just finally got around to making a blog button!! It took a few attempts–for some reason, when I read that Blogger doesn’t like quotes and replaces quotes with &#34, I thought that I was supposed to omit the quotes from the code around certain URLs. I read carefully and finally figured it out! Thanks again–a great service to those of us who are HTML challenged! Hi! I am a newbie blogger, still trying to figure out all the “dashboard” stuff that goes into running a blog. I wanted to thank you for this tutorial, it worked like a charm on the first try! I found it really clear and really easy to follow. Hi! Thanks for the post, this is exactly what I have been wanting to do. Wondering if you could help me out though. I’d be happy to link back to you because this has been extremely helpful…however, I can’t make it work. Not sure what I am doing wrong, but have no doubt that it’s something. I would like to ask for your help. Yes I have read all the directions from the start. I can get the link but not the picture. confusing to me. Plus my image doesn’t have a www in front of it. Removing all the &#34 why and replacing them??? what do i replace them with????? I’ve been trying and I can’t get this to work. I created my button in picnik, saved it into picasa web albums but cannot find a URL for it. Right clicking gives me lots of other options but not a “copy image URL”. I’m guessing I didn’t upload it properly, so how do I do that? Can I just say a huuuuuuuge thanks! I found your site and your tutorial on making a blog button was so very helpful. I just made one of my own! Little old me…..stay at home mum, ex preschool teacher…what do I know about HTML?????? But it worked! Thanks again. You’ve worked hard creating this tutorial. Like you I’m an avid user of Picnik but unfortunately Google have decided to shut it down in April. There doesn’t seem to be an alternative to the simplicity of Picnik used in conjunction with Picasa. Sorry for the late reply, but http://pixlr.com/editor/ is a free editing system that I use. No, it doesn’t have the simplicity of Picnik – it’s more similar to Photoshop, but it does work and you can save your changes to your computer, then upload it to your Picassa account. It doesn’t have Picnik’s fancy frames (I didn’t use anyway) but has inner/outer framing plus all the essentials and easy to use. Perhaps this is one to consider when April comes. Like Picnik ipiccy is also Google as it shows as part of the Google+ platform. There are net protest movements ‘Save Picnik’ and ‘Saving Picnik’. Good luck to them but slim chance I would think. Thank you so much for this tutorial. It was so easy to follow compared to some of the other tutes out there. Created my first button in under ten minutes! Thank you! Ok, so it’s seriously not appearing. But I think it’s something like this : ” <a href " and then all the other things. So, can you please help me? I think this did not appear in the above comment. SO, here it is. this appears in text. Please help me. Thank you so much for a clear tutorial! A girl like me who is still learning all of the code and how it works really appreciates how simple this was to actually create. So when I follow all of your instructions I just end up with a box with ? in it and the written info below. Why don’t you send me an email and I will try to help you sort all of this out? dp@mypregnancybaby.com. Hi – I cannot figure out how or where (on Picasa) to get my button image URL to copy and paste into the code in the text box. Can’t get this to work. 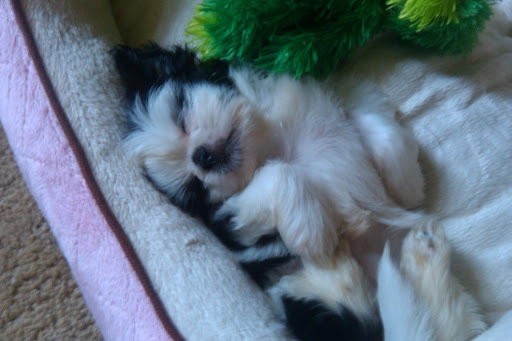 In Picasa Web Albums, click on the photo you’re interested in. 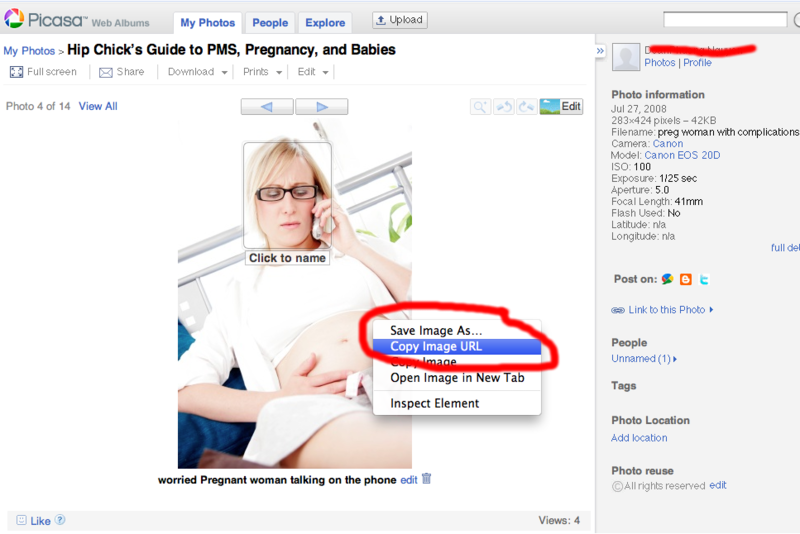 Right click on that photo, and select “Copy Image URL” when the option comes up. That’s how I was able to do it. Since you have Wordpress, you can also upload it to your Media library, and use that photo URL instead. Thank you for your awesome content! You do a great job explaining things and I actually feel like I learned something today…I don’t have children, nor have any plans to…but your blog is on my favorites list. You are magic! I never thought I wouldbe able to sort out how to make a button but I ahve done it with your help! Thank you so much!! Thank you for posting this. I have been trying and playing with the code for 2 days and I almost have it but it still will not work for me 🙁 Do you think if you have time you could email me a little guidance? Awesome! Thanks so much =) The info you posted about the quotes really helped!! For now, I will leave it as it is on my blog. Peeps are not able to “grab my button”. It just takes them to my other online boutique until I can get these codes right. Probably seems devious to most, but I’d rather have my button showing and doing the wrong thing than no button at all. Thank you so much for your post! I haven’t done HTML in SO long! It took some tinkering (mostly with copy/pasting the image URL) but I think I’ve got it now! Do I have to have a domain name linked to my blog in order to find the URL of my blog? Just the blog name (blahblah.blogspot.com) doesn’t work. Even with the http:// before, it seems I need a www. That seems to be what you have so I think that may be the missing piece. I have been wondering how to do this for ages! Hi there & thanks for the tutorial!! For some reason getting my button on my blog is just not working- actually, i am doing something wrong! Yey!! super useful! ♥ thanks much! Hi. I really appreciate you doing this post and look forward to perusing your other helpful posts! I am, however, having a dickens of a time trying to get the code from the image. When I right click, I can not get a short image url. It says copy image address. It is very confusing! I have spent hours this morning and just need to ask for help! What can I provide you with to help me? I thank you so much in advance! That post was soooo helpful! Thank you so much! But im having trouble from step 3, Iv created my blog button and saved it on the computer but what do I do next! I uploaded it onto piscasa web albums but I dont know what to do now! thanks for the tips! i posted a link to your site on my blog! Ok, so I got step one complete, but step two is not working for me. I’ve uploaded the pictures (I have 2 blogs and need a button for each) but when I right click on them, there is no option to copy the url, only the usual save as options. Is there another way I can get that code? 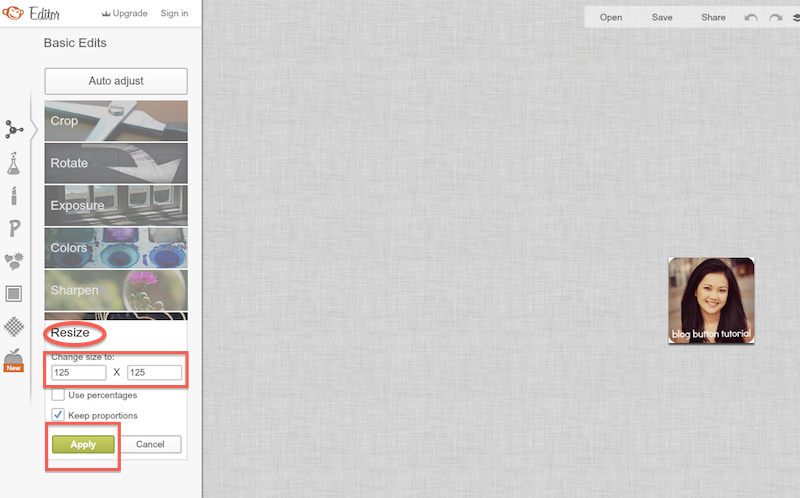 Also, my Picasa page doesn’t look the same as your screenshot. Could it be a different version? Please help,……….I made the first set of codes,..what do I do with them? Under Step 4, is that your final code, are you supossed to add the code from Step 4 before it? I understand how to plug everything in, I am just not sure if I have it all in it’s entirety. The code in step 4 is the only code that you need in order to make the blog button and grab box appear. Thank you for taking the time to create this! I can’t wait to try it. I have been wondering how to do this, and your post is very helpful! Do I fit this entire code into the “grab my button” code under “your button image url”? I did this, but two buttons come up. Please help! Thanks! You should only use the code from the “Grab My Blog Button.” That’s the only one you should use. The other one was just to explain to you what people will grab. Hope this helps. message me back and i’ll give you details so you can help me. Hi! You need to use the code in Step 4. Just change what’s in red to your own specific needs. Good luck. Email me if you need me to help you further. I am so glad I found your website. This was so easy to follow. I made my button and uploaded it to PIcasa but the URL is nothing like what you posted. What I am doing wrong? Did you right click to get the URL? It needs to have a .jpg ending, or something similar for it to work properly. So glad I came across your post on bloggymoms. I am a new blogger and looking to brand myself! Wasn’t sure how to do this and now I know! Thank you!! Thank you so much for providing such an easy to follow explanation. I now have a gorgeous looking Badge on my site! I found a link to your post via an endorsement from another blogger on Bloggy Mums. How funny- I just made a similar Tutorial on creating custom blog buttons! The button shows up, but it’s not linky – and is followed by code. . .
For whatever reason, the code I pasted into the comment window isn’t complete. Email me and I will try to help you out. I never thought I would be able to do this , I meanm I am totally dumb for this code stuff, but we made it! Your smart quotes tip was RIGHT ON!!!! now I have a cute button thanks to you! Before reading your last post here, I tried to fix it and it is now working!!!!!!!!!!! I just have a question. I have now 2 “buttons”, one with image and code box below and another one just with the image. Even though I have tested and the code is working, I just want to make sure I should have 2 buttons and if so, where do you usually put the button image? I tried without step 3 to avoid 2 buttons on the side bar, but when I would copy and paste the code in the grab box it only show a window with a question mark in the middle. (I think is because it couldn’t find the picture). Now that I followed all steps, the copy and paste is working (it is showing my button) but as I said I have 2 buttons on my side bar. I’m grabbing your code right now and placing on my blog! Please skip Step 3, and just make the Grab the Code Box. I think you’re getting confused. The step 3 with the button image is the code readers get when they copy and paste the code in your Grab box. Anyway, just skip step 3 and only use the code in step 4, and that should clear up any confusion. 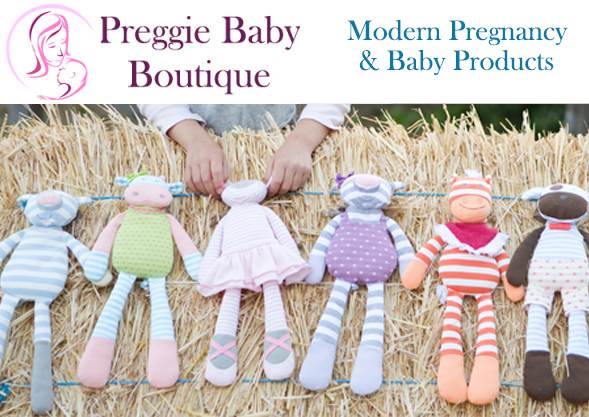 If you still have questions, email me at dp@mypregnancybaby.com and I’ll do what I can to help you. All I ask is that you link back to my site or this blog post. It’s me bugging you again. I just had a general question about clip art….is there a way to use clip art images in my blog for free? I know there are sites that you can use, but you do have to pay for the images even though they say “free”. Is there a way to use clip art images without paying, or do you reccommend subscribing to one of the sites for a couple hundred bucks a year? Thanks, hope you are doing well! I use a few places for my free stock photos. I think these places also have clip art, but I use Stock Exchange (http://www.sxc.hu/) and PhotoXpress.com. I just bragged about you and your blog on MommyBlogs.com! Thanks again! I did see in one code they use quotations marks AND the &#34 (or whatever it is). Is that ok? I didn’t know if I should change the other quotation marks to the other code….. This has been fantastic although I can’t get it to work. I am ready to kill someone. Any chance you could help me out. I’ve been working on this for 2 darn days, which is ridiculous! Your post has been THE most helpful, but it’s not working. I’m on blogger and when it doesn’t show up on my blog, I go to Edit my gadget and then code is missing. Is that weird? And do you put both codes in one gadget? HELP! Did you use the code in step 4? That’s the ONLY code that you’ll need. You don’t have to use both codes. I will double check it. I tried all different combos – I am NOT a code person for sure!! Nevermind! It worked, I LOVE you!!! Iwill definitely share this post and your site everywhere!!! Thanks so much! Your tutorial is great and I have almost got it. I just have some words that are showing up outside the link box. I think it may be related to by button being 200 wide and 35 in length. Can you help me? This is what I have. I can NOT get the brab my button part to work for me…I end up with three pictures and some codes! Can you help me? I will CERTAINLY link back to this post! I got the button part perfectly thanks to your help! Awesome post! Thank you for the clear instructions. I found it very easy to follow and now have blog button! Hello! I’m having the SAME issue that “confessionsofamoneysavingmom” is having!! Creating the button was very easy thanks to your tutorial, but the code stuff is not working exactly like you mentioned…..grrrr… Help! When I right click on the newly created pic in my Picasa album, it gives me this really long name that doesn’t at all look similar to your example (it doesn’t even include the name of the JPG file for some reason) and therefore I think it will not work because of that. Any help you can provide of suggest will be greatly appreciated! 🙂 Thanks! Thank you so much for this! I have been wondering how to do this for ages! Your blog is really helping me with my blog! There was a little learning curve. Once I read EVERYTHING you posted, blogger and I were friends again. I just wish I knew how to center it on a page. I can get the icon to center but I can’t get where they get the code to center. But at least people can get it now. YAY!!!! Oh my goodness sakes!!! I am SOOOOO frustrated right now with this darned button business!! BTW Hello, you commented on my Mom Bloggers Club profile, I am now a new follower of yours and absolutely love your blog! And would absolutely adore it if you would follow back…NOW back to my frustrations! I created my blog button (finally after months of not understanding how, you totally made it easy and enjoyable!) BUT I cannot for the life of me, get these darned codes right! I am going out of my mind! Everytime I create the html gadget,my blog button never shows up for me, and when I click in the general area of where its supposed to be, it says ‘sorry this page of Confessions of a Money Saving Mom does not exist’ but it has my blog name highlighted to where they could essentially get to my blog anyways, but oh goodness this is driving me bonkers honestly!! Help please!? I would so appreciate it, I am really trying to do it myself I promise but wow! Sorry for the book worthy comment! You can email me at angelsamongus1986 at yahoo dot com! This is so wonderful. Thank You! Thank You! I’m gonna get right on this. How great of you to post such helpful things without charging for them! And I know Classified Mom, your recent commenter, is just as helpful! I’m very new to blogging so I am LOVING finding not only a lot of GREAT blogs but also some great bloggers so willing to help us “newbies! !” 🙂 Thanks! This is great! When I get home tonight this will be my new project!! Thank you! Hi Aimee – Thanks for the tip. I definitely agree. I am going over to check out your blog right now! I’m a new follower from http://365daysasmom.blogspot.com/ I hope you will follow back! I’m trying to create a new button and also a banner for my blog. You info was useful but how can I do something like this if I’m not going to be using a photo? And how do I create a banner? Hi Erica – What do you plan to use instead of a photo? Do you mean that you want to use text instead? You can still follow the instructions, just create a blank canvas with any color you want for a background. I’m a new follower from Social Moms! Ooh, I definitely need to create a “button.” Thanks for the tutorial. I just started following your blog. Hope to see you around on The Decorologist! btw great tut on the button! I have to redesign mine I think, this is a great quick read to freshen up on the directions! Bridget from Being Frugal & Making It Work! Cool! This will be so helpful, I just started blogging and my daughter is helping but with 3 kids under the age of 6 it is hard for her to help all the time. Thank you for sharing!! This is perfect and super helpful! Thanks! Carla – Please let me know how it works for you! Good luck! DP–this is great! It is so perfectly straightforward…I can’t wait to try it. Except that I have to wait until I can do it all in one sitting because it is so entirely new for me. I’ll let you know how it goes!